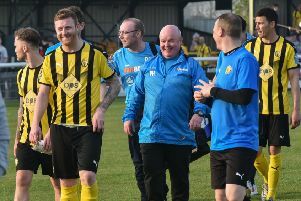 Brakes earned a creditable FA Trophy draw against National League opponents Altrincham. Rob Ogleby scored the goal which levelled the tie less than a minute after coming on as a substitute, cancelling out Damian Reeves’ opener for Lee Sinnott’s men. Alty dangerman Reeves planted an early shot wide of goal, while Jack Edwards ended some neat build-up play down the Leamington left when he received the ball from Lee Chilton and fired just over the bar on the turn. This was quickly followed by a shot just past the post by Ben Mackey. Tony Breeden was called into action for the first time when James Lawrie’s 25-yard drive was pushed away. Reeves then struck the upright with a header from a long throw for the hosts. The two-division gap did not faze Leamington as the chances continued to come at both ends. Richard Taundry tried his luck from distance with a powerful effort that was deflected just past the post with Alty keeper Tim Deasy scrambling. Edwards was brought down by Scott Leather in a central position outside the box, presenting Lee Moore with another chance to exercise his dead ball skills, but Deasy was equal to his curling strike, pushing the ball over the bar. Michael Rankine headed wide from Jordan Sinnott’s free-kick and Leather saw a shot blocked by Breeden, Reeves firing the follow up over the bar as Leamington stood firm. The visitors made a sluggish start to the second half, however, and were the grateful recipients of a rare slice of good fortune when Lawrie’s shot from the edge of the box squirmed under the body of Breeden only for the ball to stop short of the line, allowing the Leamington skipper to retrieve it. Chilton came close to handing his side the lead when a driving run into the box ended with a stinging drive that was parried by Deasy, Mackey’s follow-up striking a defender and going behind for a corner. James Mace then forced another save with a header from an Edwards flick-on, before the home side took the lead with 20 minutes remaining, Reeves displaying a goal-poacher’s instinct to follow up a shot from Rankine that was parried by Breeden and slamming the loose ball into the net. Unperturbed by this, Leamington continued to get forward and Mace had a fantastic chance to level when he flung himself at Edwards’ cross from the dead-ball line, only for the ball to fly just over the bar. Jamie Tank blocked another shot from Reeves, which led to a corner from which Breeden produced an outstanding save to deny Sinnott, the ball clipping the inside of the post. Fry and Joe Magunda were well placed to block further efforts on the Leamington goal in the aftermath. Paul Holleran introduced Ogleby and Ross Oulton and, within a matter of seconds, the former had latched on to a pinpoint clearance from Breeden to go one-on-one with Deasy, clipping the ball past the advancing keeper for a well-taken goal. Hood intervened to clear a dangerous chance for Altrincham inside the final minutes, but Brakes held on for the draw and will now fancy their chances of a cup upset on their own patch in the replay. Altrincham: Tim Deasy, Adam Griffin, Jake Moult, Gianluca Havern , Scott Leather, James Lawrie, Simon Richman, Michael Rankine (George Bowerman, 84), Damian Reeves, Ryan Crowther (Nicky Clee, 64), Jordan Sinnott. Subs not used: Sam Heathcote, Callum Williams, Rhain Davis. Brakes: Tony Breeden, James Mace (Ben George, 86), James Fry, Joe Magunda, Jamie Hood, Jamie Tank, Lee Moore (Ross Oulton, 76), Richard Taundry, Ben Mackey (Rob Ogleby, 76), Jack Edwards, Lee Chilton. Subs not used: Will Green, Nat Kelly.